After reviewing Wizz Air website as an online place not offering a pleasant customer experience, let's continue this trend with another user unfriendly site flibco.com, the online presence of a Luxembourgish bus shuttle service operated by Sales-Lentz. The service offers bus transportation between several Western European countries primarily connecting Luxembourg with a couple of secondary airports in adjacent lands. As we are going to see, not only airline companies offer terrible websites but the same is also valid for other kinds of carriers independently of the assumption that a transportation service depending mainly on web reservations should offer a good online service too. My particular experience with flibco.com started with their website not working with IE 8 and the browser constantly crashing and restarting itself but I'm not sure if the problem has been in the site itself or there are some compatibility issues between my computer and flibco.com. So, let's assume it is not a sin of the site and continue with its true flaws. Similarly to Wizz Air, flibco.com does not offer a shopping cart, so if you want to book tickets for more than one route or for several trips, you have to proceed with the reservations one by one. Of course, this is tedious process because your booking data is not saved at all. It doesn't matter if you've entered your information correctly or not, you have to re-enter it every time. And at the end of each reservation you must enter your payment details again, too. Another pretty annoying issue is that flibco.com forces you to enter a "flight destination". First, somehow the site assumes that a flight destination exists when this is not mandatory to be the case for you and second, even not all of the possible airports in neighbouring European countries are listed in the dropdown box, not to mention other cities. Naturally, if you miss to fill in this field, all of your information is deleted and you have to re-enter it again, so it is better to put something in (obviously, in many cases, it will be whatever flight destination you like from the available options in the dropdown list). It's a solvable problem but it's another nonsensical requirement anyway. During the booking process you'll be referred to "my flibco.com", for example, to print your reservations. It might seem like a mistyped URL to you but in fact, it's not. This is a section on the site where you are able to access your purchased tickets. Still, its name is confusing when you read it among other pieces of text thus I count it like another user-unfriendly feature of the website's design. To sum it up, flibco.com is not the friendliest site out there and I just hope their bus service will be better than the online booking experience they offer. At least it's not an airline company so I'm slightly less concerned in comparison to what I should expect from Wizz Air's flight service. Examine our maze of reviews to discover other reviews of services. Several days ago, I had to make flight reservations at WizzAir.com for a couple of flights in Europe. While I haven't made myself sure yet that Wizz Air airline service is also a low quality one in addition to being low cost, I can definitely say that Wizz Air's website is terrible and very user unfriendly. I have always wondered how it regularly happens that big companies with a considerable amount of constant expenses cannot manage to put aside some resources once in order to create a decent web site. It's even more shocking when talking about companies whose business is very closely related with the Internet. Apparently, Wizz Air's website offers one of those nasty web experiences and frankly speaking, in result of that "user friendliness", I'm quite concerned about the quality of their airline service too. To start with, there is not a shopping cart at Wizz Air website (so you are not able to make more than one reservation at a time). If you want to buy tickets for several flights, you have to go through the whole process again and again. Of course, if some kind of error happens (and errors do happen often at WizzAir.com) you'll have to make even more iterations entering your details. It's not the world's end but it's really boring when you do the same thing several times in a row. The next surprise coming from Wizz Air is that entering your address is mandatorily. But the surprise is even bigger because the address field is so short, you practically cannot enter even a middle-length address. Of course, this makes the requirement for entering your address redundant and mostly annoying because you have to enter something anyway though it is not your actual address. Now, another weird event follows at WizzAir.com. You make a reservation for a flight and the prices are shown automatically in a particular currency (probably the one that is somehow considered to be best for you). Then you make a reservation for another flight and oddly enough the currency is automatically changed to another one. In both cases if you decide to choose another currency some unpleasant exchange rate is applied so you unwillingly prefer to keep the automatically proposed one in either case. Let's make an online check-in. You have to enter your Wizz Air flight confirmation code and some additional information and then a couple of forms appear which you must fill in. After doing so you hopefully press the confirmation button but (not so) surprisingly you receive a connection error with a message that probably the lines are overloaded. Naturally, all of your information is lost and you have to enter it again. Well, you make a second attempt and this time you get another error: pnrParseError. At least, one cannot complain of error diversity at Wizz Air's website. Well, I understand that Wizz Air is a low cost company and they offer cheap services but I don't think it will cost them a fortune to implement a user friendly and working site. After all, if they rely on the size of their customer base, having a crappy website is not the best way to attract returning customers. And it is definitely not a good recommendation for a company in a risky business like airline carriers. How a passenger could expect safe flying after going through such a nasty online experience? Browse our Review Maze to find out other reviews of services. Priest is the second feature of director Scott Charles Stewart and his second collaboration with Paul Bettany after Legion. 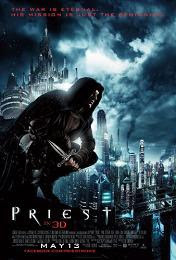 Priest is a movie that mixes post-apocalyptic sci-fi, western and the vampire genres and it is based on some Korean graphic novel series of the same name. The premise of Priest is quite straightforward and cliched and is told in an animated intro (apparently the filmmakers were running on a tight budget). There was a war going on between humans and vampires raging for ages. Humans won the war after their super warrior-monks (a.k.a priests) defeated the vampires. At the time of the movie, vampires live in reservations, humans are closed in cities (think Judge Dredd) and governed by the Church. The order of the priests is disbanded and only a few of them have survived. Vampires in this universe are non-human hive creatures, the only feature distinguishing them from any generic stock monsters being the slaves they occasionally keep to feed on their blood. The cast of Priest features some heavyweight names. We have Paul Bettany (as the priest), Maggie Q, Karl Urban and a small role for Christopher Plummer. A role of the kind that makes you wonder why they would need an actor of that caliber to play it. Oh well, maybe he lost a bet or owed someone a favor. Or he got some large bills to pay. Anyway, Paul Bettany is pretty much the only redeeming feature of this movie as the lean protagonist. Of course, it is not really an achievement of the film and, more specifically, the script. It is just that Paul Bettany is cool as an action hero. And that was the case with Legion too, so no surprise here. Considering the director's visual effects background one can expect lots of CGI in Priest and this is indeed the case. Creatures and environment designs are not very inspired, though. There is an overall impression of derivativeness. The movie sports a bleached and contrasty look. Not unlike The Book of Eli in that regard. And, incidentally, Priest was shot by the same cinematographer, long time Robert Zemeckis' director of photography Don Burgess. To give Priest some credit, the short length of the movie leads to some fast paced story development. But this is brought down by predictable narrative, zero character development, some embarassingly cheap drama (admittedly, a little less compared to Legion) and cliched action sequences. Dull and forgettable. The humorless dialogue doesn't help, either. The 3D is another disappointment. Priest is one of these movies shot in 2D and post-converted to 3D and this shows. To sum it up: you should probably skip Priest, unless you are a fan of the genre(s). And if you decide to see it, go for the 2D version (if available in your area). Go through the Review Maze to discover more movie reviews. To call 1927's Metropolis just a classic would be equal to devaluating it. There have been lots of classic movies through the years but not so many of them have been called prophetic, the first science-fiction masterpiece in cinema or highly influential. Fritz Lang's Metropolis is easily all of these and maybe more. It is probably one of the very few films of such an old age that still plays very well nowadays. And it's a pleasure to find out countless prototypes of future movies' characters, machines, cities, etc. while watching it. 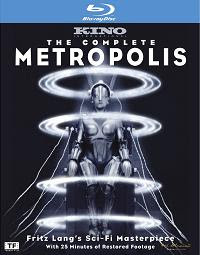 Metropolis tells the story of a futuristic city divided into two well defined halves, each of them ignorant of the other. The first society, living on the surface, is wealthy, educated and running the whole town. The second one, living underground, consists of near slaves forming the working power of Metropolis. Freder (Gustav Froehlich) is the son of Joh Fredersen (Alfred Abel), the mastermind of the city. One day Freder sees Maria (Brigitte Helm), a beautiful woman, who is visiting upper Metropolis with a group of children and he falls in love with her. He starts looking for the girl and in the process he discovers the underground worker's city. Even prior to the appearance of Rotwang in the movie, the viewer should be already convinced that this is not an ordinary film. Metropolis is notable with variety of things. Even the aforementioned summary of the plot does not cover all of Metropolis key elements. The movie is quite complex even if somehow illogical. Fortunately, this is the film's only fault and although I have always been keen on criticizing poorly constructed plots, I am going to refrain this time. Metropolis is a home of so many virtues that its only flaw is easily excusable. Metropolis sports a complex story which makes it a good basis for spawning several remarkable character prototypes. Our main protagonist Freder is a lonely hero who's fighting for justice. We've seen him in countless future movies. Maria, except for being the hero's love, has much more to offer since she is also a prophetess and the main force behind the upcoming changes in Metropolis. But the film's most influential figure is neither Maria nor Freder. Enters Rotwang, the mad scientist dreaming for revenge and destruction. Do you remember how many times you've seen this archetype in sci-fi movies? Countless again... His unrealized love for Fredersen's late wife fuels him with power and anger to produce fearsome inventions. And then there is the Thin Man, the not-so-clever thug with a rectangular and emotionless face. Metropolis has them both with their typical look we get accustomed to see from so many inventor-villains and expressionless cut throats we've met through the years. Rotwang has even an artificial hand. Still sounds familiar? Read the second part of this article by going to Fritz Lang's Metropolis Review, Part II. Read the first part of this article by going to Fritz Lang's Metropolis Review, Part I.
Metropolis has not only introduced characters. In addition to Rotwang's artificial hand there are numerous details that have influenced the movies to come. The city of Metropolis with its skyscrapers and highways in the air or its underground section has provided innovative images grown into a standard for futuristic cities. The laboratory of the evil genius Rotwang has been re-created again and again. The humanoid robots have become an organic part of sci-fi cinema. Changing faces is another familiar trick. 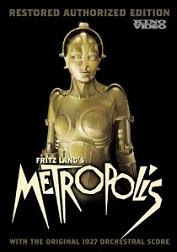 Introducing places of pleasure like brothels or bars in science-fiction films could also be attributed to Metropolis. And there are even videophones. Metropolis offers tons of sparkling originality: clock-like behaving workers, some of them operating machines similar to clocks (homage could be seen in the video of Queen's song Radio Ga-Ga); a clock with 10 hour scale in order to count down the time for a working shift; imaginative Pleasure Gardens; a Babel Tower reference; doors closing and opening on their own; a passionate robot dance; light and shadow games; powerful mass scenes. There are plenty of visual effects starting from the look of upper Metropolis with its skyscrapers and highways through the light rings and electrical arcs in Rotwang's lab to the collapsing underground plant. As a part of German Expressionism, Metropolis manifests most of its characteristics. The performances are over the top, the set designs are stylized, there are plenty of symbols, crowded environments, monumentalism, angular buildings, dark shadows, etc. But Metropolis has influenced thousands of films not only because of its expressionist style but also due to ideas far ahead of their time. You can see mad scientists, humanoid robots, artificial hands, Metropolis-like cities and other of its creations in movies like Blade Runner, Star Wars trilogies, Dr. Strangelove or: How I Learned to Stop Worrying and Love the Bomb, Dark City, The Fifth Element, Batman series and so on. And after Metropolis, science has been used quite often in cinema as a cause for an eventual end of humanity. Metropolis offers also a portion of social elements by depicting classes separation and their mutual unawareness. It shows that a constantly oppressed working class would rebel against its rulers sooner or later. Yet, a leader and good organization are needed in order complete chaos and self-destruction to be avoided. Fritz Lang has created a viable picture of contemporary and future societies divided in classes ignorant of their own needs and interests as well as miscommunicating between each other. But the movie also shows that a wrong leader could be disastrous possibly hinting at the rise of Nazis and their Führer in Germany. The otherwise silent black-and-white original Metropolis has been "enhanced" through the years with color tinting and modern musical score. Unlike the similar altering of Nosferatu, the musical score here is not such an annoying addition and fits well into the film. Big parts of the genuine picture has been missing for years and occasionally new pieces have been discovered but even now there is not a fully reconstructed original version. As strange as it may seem Metropolis has aged quite well. The movie magnetically attracts the spectator from its very beginning and contrary to many other films of that era it is not boring or alienated. Metropolis' charm roots partially in the great talent and efforts involved in its making and on the other hand its fascination is coming from the fact that the audience of today is discovering in astonishment where it all has started for the science-fiction genre in cinema. It is a pleasure to find out so many resemblances with future movies and if you haven't gone through this gratifying experience yet, do not postpone it for too long. Go through our maze of reviews to discover more movie reviews and articles.